Glorious India, the Mega Trade Expo, is scheduled on 27th-28th May, 2017 at New Jersey, USA. The event is designed to facilitate promotion of Indian businesses in USA, one of the strongest economies in the world. It is organized by Praveg Communications Limited, a prominent name among event management companies in India with over 16 years of experience in organizing about 600 national and international events. Praveg had successfully organised Glorious Gujarat USA last year in New Jersey, USA, which witnessed over 15,000 footfall and participation of about 100 exhibitors. Glorious India has received support from several US-based Indian state community organizations. Among them are NATA (North American Telugu Association), RANA (Rajasthan Association of North America), CAB (Cultural Association of Bengal, North America), Maharashtra Mandal, New York, Gujarati Samaj of New York, Kannada Cultural Organization and Orissa Society of Americas. Over 25,000 NRI visitors will attend this two-day event that is focused on promoting businesses of Indian exporters to the US market. Many chambers of commerce from India have also lent their support to Glorious India. The Exposition has planned five sector-specific pavilions i.e., Garments, Handicrafts, Gems & Jewellery, Indian Real Estate properties and Indian Tourism Products to cater to the strong demand of NRIs and American trade for these product categories. Other sectors like food products, engineering products, etc., will also witness significant participation in this Indian Trade Expo. The event will showcase vision, development policies and achievements of Government of India and the state organisations in its exclusive Government Pavilion - Pride of India. One of the major highlights of Glorious India Expo is the Superwomen Pavilion , which will witness participation of women entrepreneurs from India. Structured B2B sessions have been arranged to facilitate long-term strategic business alliances of Indian exhibitor companies with the US-based trade. About 500 US-based buyers will attend the event to explore business prospects with Indian garments, handicraft, jewellery, real estate and tourism companies. With more than 25,000 footfall and 500+ buyers, Glorious India makes for the complete business promotion package for Indian exporters and Indian companies, who are planning to enhance their brand image, promote their products & services and expand their market in USA. High decibel advertising in national channels of India and Indian channels in the US, roadshows, press advertisements and aggressive social media campaigns have ensured high awareness and promotion of Glorious India Expo in India and US trade fraternity alike. Besides, to facilitate highest participation of Indian companies, Glorious India Expo has introduced a slew of incentives including attractive price of participation, complimentary hospitality of the US-based buyers invited by the exhibitors under 'Host your Buyer' programme and insightful seminar sessions. 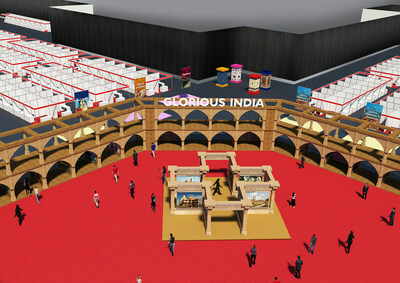 Detailed information about the event can be obtained by visiting http://www.gloriousindiaexpo.com . Praveg Communications Limited is the leading event management company with a track record of executing over 600 events in India and abroad. For more than 15 years now, Praveg has created new standards of event design, execution and management with its continuous concerted efforts and commitment to high standards of quality and efficiency at work. For more information, please visit http://www.praveg.com.